I found some late-night motivation and looked through your patches. I’ve applied all your qcodeedit-based patched to svn, including two small fixes I added. Also, I disabled qcodeedit by default for now. I didn’t include your operator additions as I wasn’t in the mood for thinking about that. Somehow, my ‘git dcommit’ didn’t keep your name anywhere in the patches. Not sure why, but anyway, for those reading commit emails: All the qcodeedit stuff was written by Giles. Thats cool. 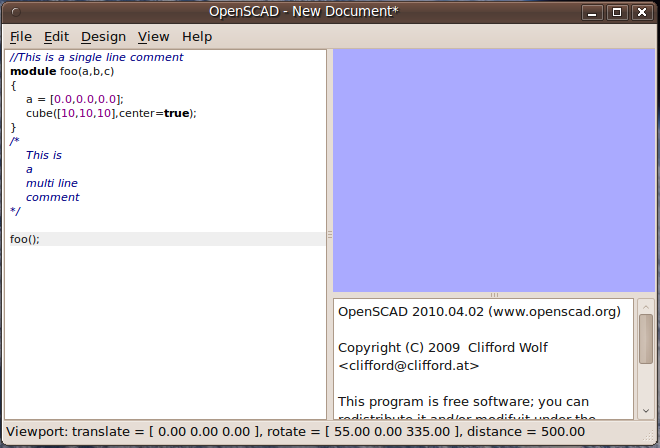 I do like the idea that openscad can use an external editor, but it also seems nice to have a fully integrated syntax highlighted, editor as part of openscad itself. It would be nice to make use of the other features of qcodeedit such as line numbering, code completion, code folding etc. Thanks! Syntax highlighting is really useful. I found that I make much less mistakes and it’s requires less thinking to read code.